A journey through time, walking between Roman walls, medieval residences and imposing fortifications in a city rich in history. The excursion begins at what was once the home of the artist Ivan Meštrović, now a museum, allowing us to learn more about one of the most famous Croatian sculptors of all time and admire some of his works. We head on foot to the magnificent Palace of the Roman emperor Diocletian, built in the ancient part of the city in the 4th century BC on the request of the emperor himself, who withdrew there following his abdication. We'll visit the building's cellars where, thanks to their perfect state of conservation, we will learn about life in the palace and all the customs of the time. We continue towards the Cathedral of Saint Domnius, the city's patron saint, built on the remains of one of the oldest shrines in the world, Diocletian's mausoleum. Finally, the visit takes us to the Temple of Jupiter and a few of the main monuments in Split, including the Golden Gate. At the end of this fascinating visit we can take advantage of some free time to walk through the highly colourful city market. 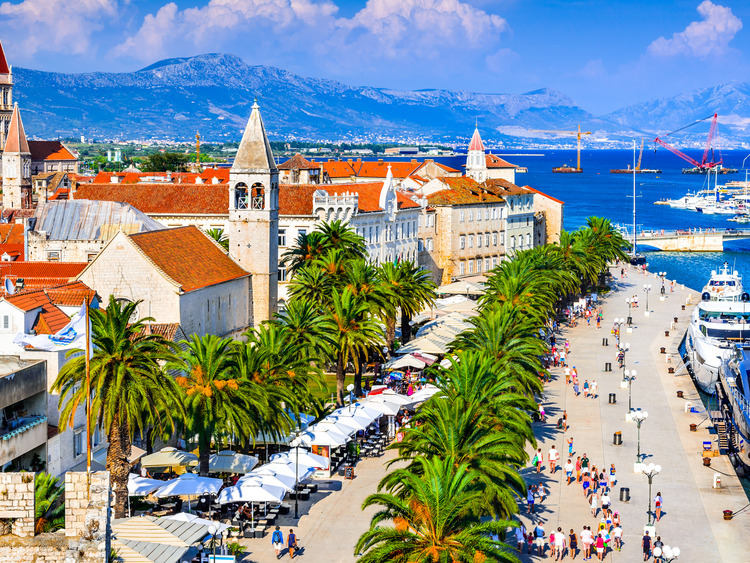 Having completed the guided tour of the centre of Split, guests can return to the ship on foot by the "all aboard" time set in the Diario di Bordo. In the event of religious celebrations, the visit of the Cathedral will be an external view only.